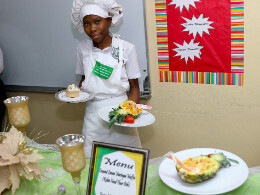 Anyah Coke, a student of A. F. Adderley Junior High School, is the winner of the New Providence District Junior High School Young Chef Competition. The budding chefs Coconut Lemon Meringue Muffin and Tropical Seafood Fried Rice tantalized the judges taste buds positioning her as winner of both the Best Rice and Best Flour categories. The judges unanimously agreed that Ms. Cokes skillfully crafted rice and muffin were both flavorful and outstanding.